View of New York from Brooklyn Heights, after John William Hill's watercolour, was engraved by William James Bennett and published by L. P. Clover in 1837 as part of a series of nineteen views of American cities. The aquatint in colour is known as the Pigeon View of New York, referring to the rooftop birds in the foreground, an ironic reference to the popular bird's-eye view prints that commonly depicted lower Manhattan. The connoisseur of American prints, I. N. Phelps Stokes, considered it "one of the most beautiful New York views of the period." Hill's watercolour, done when he was only 24, was probably made the previous year. 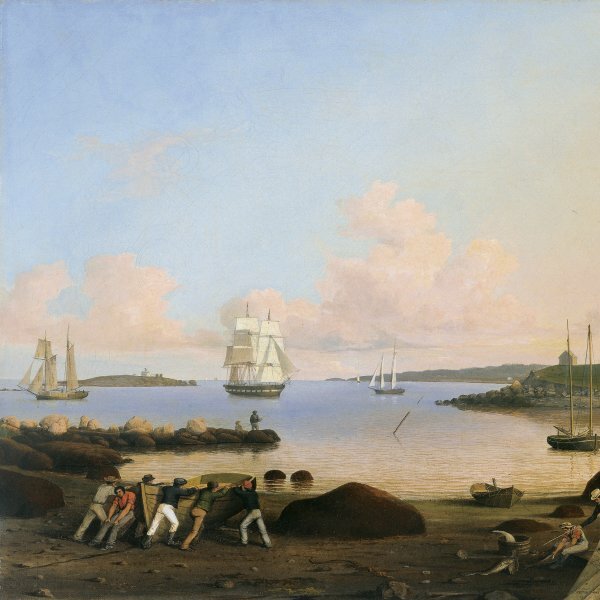 His view depicts lower Manhattan from Wall Street to Canal Street, then the most populous part of the city that had a population at the time of around 250, 000. 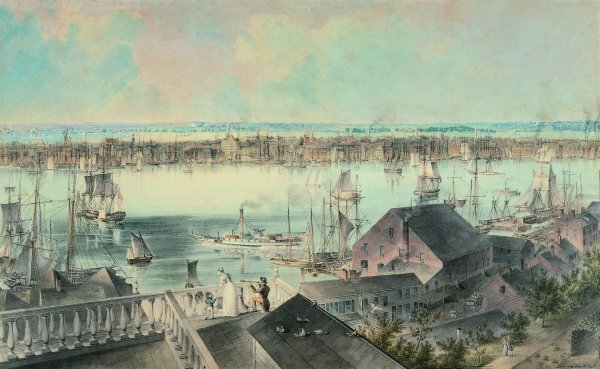 It shows anticipatory views of the Merchants Exchange-the domed building to the left-designed by Isaiah Rogers that was built from 1836-1842, which replaced the building that had been destroyed in the Great Fire of 1835, as well as the new Custom House -to the center of the composition- designed by Ithiel Town and Andrew Jackson Davis, which was built from 1833-1842. At this time fifteen of the twenty-nine banks in Manhattan were located on or just off Wall Street. Other structures shown are City Hall, Holt's Hotel, Fulton Market and the Astor House. Of the approximately 150 churches in New York, the title key of the print identifies eleven, including Grace Church, Trinity Church, St. Paul's Chapel and St. John's Chapel. The scene is viewed from a suburban residence in Columbia Heights, Brooklyn. Below in the foreground are seen the warehouses flanking Furman Street along the East River. In 1834 Brooklyn had received its city charter, opening the borough to real estate speculation. The fundamental change that had taken place in Brooklyn within a relatively short period of time can be seen by comparing John William Hill's watercolour with New York from Heights near Brooklyn, an aquatint published in 1823 by his father, John Hill, after a watercolour by William Guy Wall, which shows Brooklyn as a bucolic country retreat. A sense of order and well-being pervades Hill's watercolour, but by the time Bennett's print was published, chaos and economic upheaval had again overtaken the city. Several years of land speculation led to the Panic of 1837. New York, which had been the centre of the nation's burgeoning prosperity, suffered the most. Thousand of labourers lost their jobs as shipping lay idle and construction came to a halt. Against this economic upheaval, Hill's precise and elegant view of the city -a monument of a more halcyon time- offers an image of stability and prosperity which was sandwiched between two periods of monumental disruption for lower Manhattan, the Great Fire of 1835 and the Panic of 1837.